Sesame cupcakes made with flour, sesame seeds, sesame oil, eggs, sugar and sweet soy sauce, topped with home made Honey Meringue Frosting. The texture of these cupcakes is wonderfully airy with a crisp outside! In a food processor, combine sesame seeds with oil and puree until smooth (I had to stop and scrape some seeds off the sides of the bowl at one point.) Set aside. Preheat oven to 350°F (180°C), grease and flour or line cupcake pan. In a large bowl, beat eggs with a hand mixer until fluffy. Add sugar, vanilla essence and sweet soy sauce, mix well. Stir in baking powder and flour, little by little, until everything is well combined. Bake on centre rack for 25 minutes or until a stick comes out clean. Remove from pan, let cool on cooling rack. 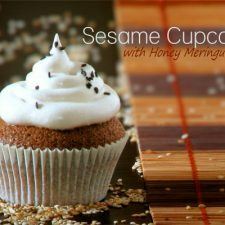 Pipe or spread frosting on cupcakes, sprinkle with black sesame seeds. In a small pot, boil sugar and honey on medium heat until bubbles emerge and it darkens. In the meantime, add salt to egg whites and beat until very stiff with a hand mixer (or kitchen aid, off course) in a heat-proof bowl (when using a hand mixer, you will need a bowl that is rather small but deep). While beating continuously, very slowly pour in boiling hot honey-sugar mixture. Keep beating until everything is well incorporated.